New Web Site featuring Daily Forcasts for you Lottery Games. 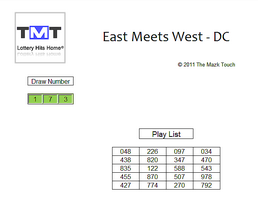 New page @ The Mazk Touch for testing new Lottery sheets. Are you Interested in linking to The Mazk Touch I or II ? Test Drive is a new page at The Mazk Touch, It is intended to let you test new Lottery Sheets BEFORE they make it to the Download Page or WIN STR8 Club. Those sheets are good for any and All-States; and it is up to you to actually TEST and see for yourself! The Mazk Touch Sheets are moved to a more secure location, so you might see a prompt for a secure link when you click on the link(s). Click on PLAY button to watch a short video clip on How to use the Spreadsheets. Nothing beats winning the lottery with your own numbers! You are in control of what you enter, you are in control of what you pick to play, use one Lottery Spreadsheet or combine a few for better results. Now that she has her own sheet, the Lottery should be afraid...More are in the way! Works great with Mirror States, Works better with Twin States . Going Up and Going Down, Hits are in the making. Pick 4 version of L L Way Pick 3. This sheet is based on a method by my good friend Four4me atLottery Post. If you are interseted in reciving The Mazk Touch Newsletter; sign up today. Pick 5 for some states with Single Digits! Copyright © 2007 - Present The Mazk Touch | All rights reserved.